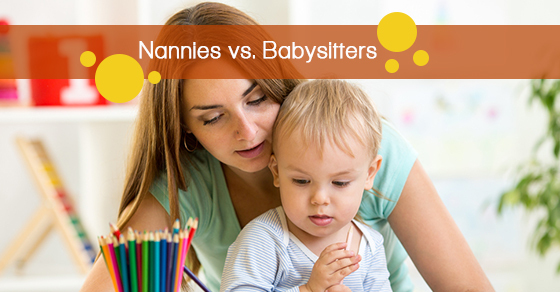 Diamond Personnel > Family Blog > Nannies vs. Babysitters: What’s The Big Difference? Nannies are often certified professionals who are employed by one family. They work full or part-time and, in some cases, live with the family that employs them. If the family requires it, nannies will also fulfill more than just childcare tasks, like preparing meals, cleaning and grocery shopping. As with any professional job, nannies are paid either an hourly wage or a yearly salary. They pay taxes and must have all legal documents (work Visas, etc.) in order if they are from another country. Nannies are also entitled to health benefits and retirement plans in some cases, depending on their employer, and are entitled to vacation/ sick days. Generally, nannies are found through an agency that specializes in placing them with the right families. They are usually 18 or older and have completed a training or certification course. Some even have degrees in child care. Nannies can also provide care for an aging loved one. There are nannies who specialize in elder-care instead of childcare and can live with your aging loved one to help them with tasks like bathing, eating, meal prep, grocery shopping, taking them to doctor’s appointments and ensuring they take their medications. Unlike nannies, babysitters are used as needed. They are not full-time employees and sometimes work for multiple families. They are paid for only the hours they work and may only be required to babysit a few hours a month. Babysitters do not have advanced training like nannies do, but they are responsible and should know the basics like CPR. In terms of age, babysitters are often in their teens. Although, there are agencies that provide babysitters, they are most often referred through word-of-mouth or are a family friend’s daughter or son whom the family already knows. If you use an agency to find a babysitter, there will likely be a contract involved, but the sitter won’t be considered your full-time employee. Babysitters usually only monitor children, but nannies are trained in helping your child develop motor skills, language skills, manners, routines and many other personal development areas. There is no one-size-fits-all model when it comes to childcare. You need to do what best suits your needs. If you’re not sure whether you need a nanny or a babysitter to care for your children, Diamond Personnel can help. Get in touch with us today with more information about nanny services to see how we can help your family grow!